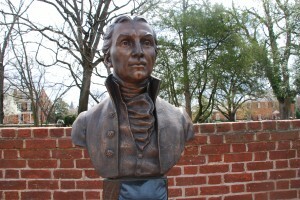 Front view of the James Monroe bust. Monroe is much beloved in Fredericksburg where his law firm is preserved. This bust was created both to commemorate James Monroe and his law firm. Sculpted by Peggy French Cresson, a renowned sculptor of bronze busts and reliefs, she donated this sculpture in honor of her husband, William Penn Cresson.4 Mr. Cresson was an architect, writer, and diplomat who wrote a biography about James Monroe that was published by the University of North Carolina.5 It was created to commemorate the James Monroe House. 1. The James Monroe Museum and Memorial Library, “Chronology,” The James Monroe Museum and Memorial Library, http://jamesmonroemuseum.umw.edu/about-james-monroe/chronology/ (accessed March 22, 2014). 2. Frank Freidel and Hugh Sidey, “James Monroe,” The White House, http://www.whitehouse.gov/about/presidents/jamesmonroe (accessed March 22, 2014). 4. The James Monroe Museum and Memorial Library, “James Monroe Bust,” Object report, Accessed April 10, 2014. 5. William Penn Cresson, James Monroe (Chapel Hill: University of North Carolina Press, 1946).